Networking, networking… no matter what industry you’re in, networking is key. If you’re in the marketing world, then it’s pretty much your whole life. But what if your business is totally online? How are you supposed to get out there and meet people when you’re always at your computer? 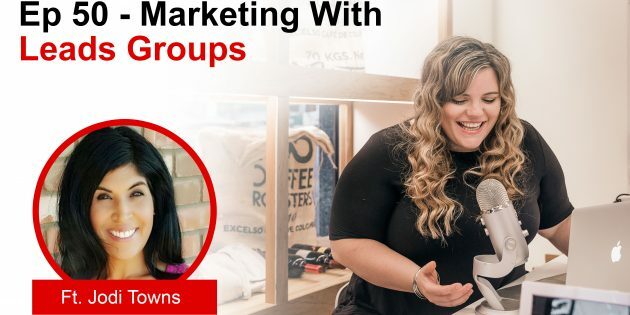 On this week’s episode, I talk with Jodi Towns about how she solved exactly that with ‘lead groups’. We discuss the need for forming these groups, how to go about it, and how to figure out what group works best for you. Jodi Towns, Founder and Marketing Mixologist for Towns Consulting LLC. Her business background is a bit of a puzzle, with all points back to “I love people!” She has been called by many friends and colleagues a “connector” and one of my favorite quotes that reads something like this, “A room full of strangers are just friends I haven’t yet met.” Professionally, she has worked mostly in the financial and healthcare industry, held positions like Director of Marketing, Training & Development Director, and CEO of a staffing/recruiting firm. Towns Consulting LLC offers go-to market strategies mostly in the healthcare space. I teach and coach physicians and their staff on how to organically market and promote their medical practices to draw in their perfect patient. Jodi offers consulting services to help businesses (mostly physicians and other medical practitioners, including cosmetic and aesthetic service providers) create marketing strategies to launch or re-launch their business products or services to the world. Jodi has spent the past 7 plus years in healthcare, specifically Concierge Medicine (membership based medicine) aesthetics and nutrition as a Marketing Director and knows what it takes to make a medical practice stand out from the rest, attract your ideal patient, build physician referral partnerships and create a practice you can be proud of! Founded in 2017, Jodi Towns has organized Networking for Healthcare Mix and Mingle events bi-monthly growing her group to 200 plus members. This group is comprised of physicians, practitioners, medical marketers/promoters and is an opportunity to build connections and relationships to support others in the medical community. She is the organizer and event coordinator for HealthNow Expo coming to Scottsdale, March 2018. Jodi is called on to speak at events, webinars, and conferences to share advice and educate on various topics around business, healthcare marketing and networking.